Speaking to the grand man of letters, Faiz Ahmed i.e. in the milieu of the art gallery, and later on at his residence at Ullash Community Centre near Sobhanbagh Masjid , one gathered about how he became a prince among aesthetes. Delving into his cultural backdrop, and how he was exposed to books, paintings and other cultural aspects, the making of Faiz Ahmed is unearthed. He said his father was the house tutor of Bikrampur's Khwaja Nazimuddin and Khwaja Shahabuddin and their sister Almisi Begum at “Nawab Bari”. Tracing his career, Ahmed adds he was the Chief Reporter of “Shangbad” for years together and held the same post once at “Azad”. In China, he was the Head of the Bengali Section of Radio Peking, the first man to hold that post. Faiz ahmed was always politically oriented, well before the so- called 'Agartala Conspiracy'. People like Kamal Lohani, in the village, where he fled to, took him across the border through Comilla to Agratalla. The Communist Party Bureau there asked Faiz Ahmed to stay on, as he was wounded, while others went to the refugee camp shelter. From there he went by air to Mujibnagar, Kolkata. Finding leftist individuals like Moni Singh, Rashed Khan Menon, Mujahidul Islam Selim etc. he tended to them. He later joined the Swadhin Bangla Betar Kendro as their Special Correspondent, to cover the liberated areas like Khulna, Jessore and to report back to Kolkata. This he said was the best year of his life. He was jailed for four years by the Pakistanis in Dhaka Central Jail and was sent to Ramna Thana for a year, in 1961. He then joined “Azad”. He covered the '65 War between Pakistan and India from Dhaka. After the War, he was taken to Pakistan to cover the war-ravaged areas in Pakistan and he was asked by the then government to write about it. 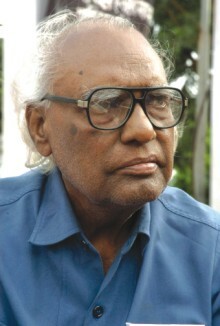 Faiz Ahmed has a compilation of a hundred books in all, based on current affairs; fiction, essays and poetry for children such as “Tulir Shatey Lori” and “Rim Jhim”. These are collection published by Haqqani Publishers, Dhanmandi. What made Faiz Ahmed, who established the first private art gallery, “Shilpangan”, one of the best connoisseurs of Fine Arts? He was in China for two years; as correspondent for the various newspapers he worked for. He went to places like Cuba, Europe and the US, he says. In the process, he tried to see as many museums and art galleries as he could, he says. He personally knew the giants of Bangladesh like Zainul Abedin, Quamrul Hasan etc – who were all this friends. He built the gallery to have a venue to project the cream of the artists in Bangladesh. While loyal to his passion for art and projecting the art of his fellow citizens, his quiet activism has always been palpable throughout the years.